A traditional “rest” travel day, which means sitting in a suit and a tie in a hot meeting room for eight hours, then doing the airport steeplechase (I had fast lane access today, hurray! ), flying for 90 minutes, and a 2 hour drive, arriving close to midnight. It’s a holiday in the Czech Republic, and I slept in long, then had a long slow morning which ended around 2pm. 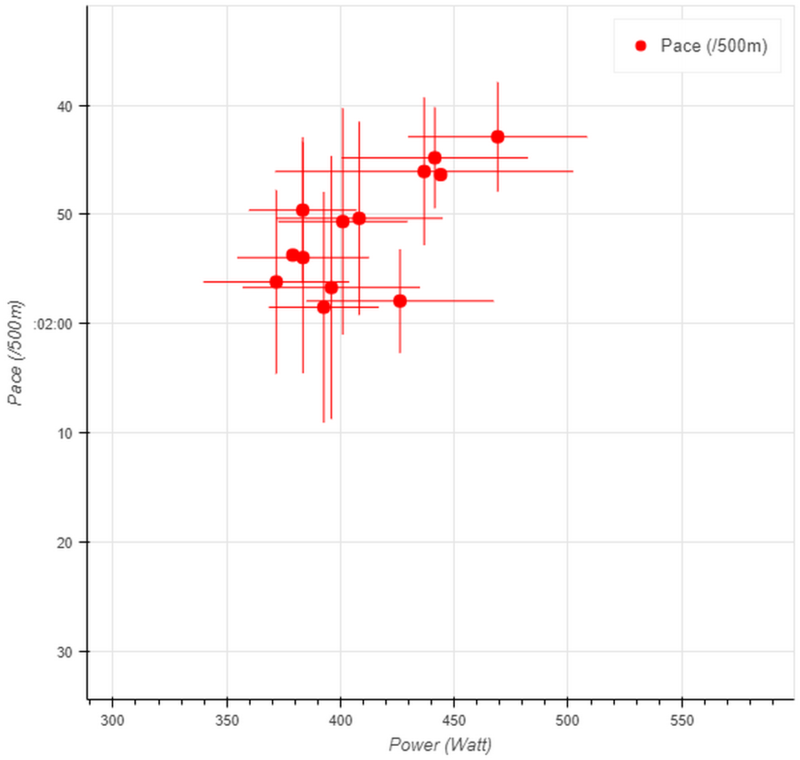 I hacked together a prototype of a new chart, which I will explain soon, over on the analytics blog. Around 2pm, I headed to the lake for a row. Getting to the rowing club was a challenge on this hot, sunny holiday. The road to the club is quite narrow, and when two cars meet, one of them has to stop at the nearest place that is slightly wider so the two cars can pass each other. Normally, this works pretty smooth, but this time the road was populated by people who don’t usually drive here. I am going to stereotype a bit, so apologies in advance, but I felt I was only meeting people in oversized SUVs who don’t really know how big their car really is. They were driving more than a meter from the guard rail, eyes big as tennis balls, scared to scratch their car. That made it slightly challenging to pass each other. The lake was full of small boats, of course. I think the water is now actually a mix of suncream and water. Wondering if that makes the boat go faster or slower. 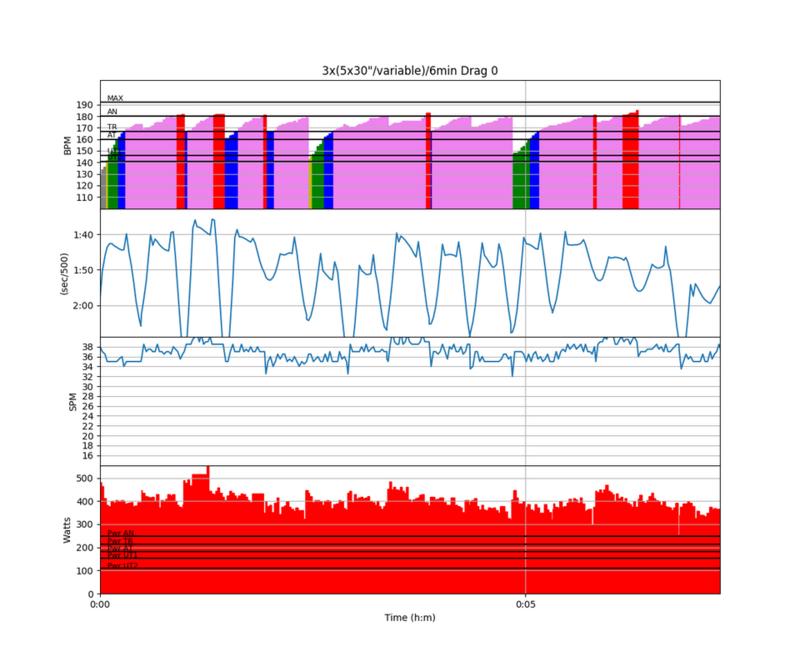 The session was 3x(5×30″/variable)/6min. So three sets of 5 30 second intervals, where the 30 second intervals were at 36, 38, 40, 38, and 36spm, and the rest is 30 seconds, 45 seconds, 1 minutes, 45 seconds. With all the recreational boats, swimmers, etc, I had to chose the bearing in the direction of the least number of boats. That involved quick 180 degree turns and other course changes depending on the traffic situation. I am happy to report that despite these challenges I was able to hit the prescribed stroke rates. This workout is not easy. 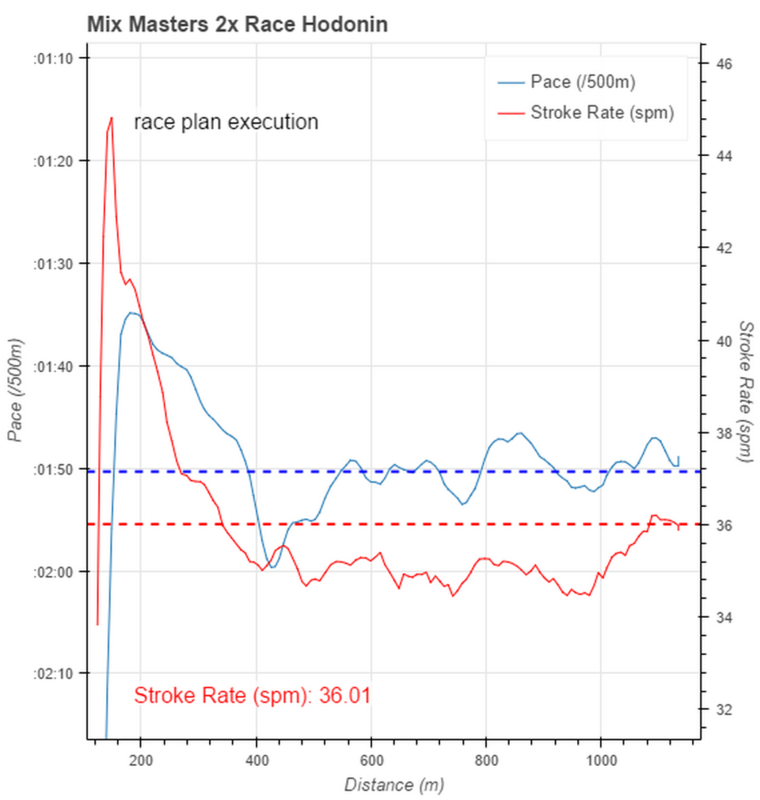 You basically go at faster than 1k race pace for 30 seconds, then you have just enough rest to paddle 5 strokes, and then you go at an even faster pace. The rest after the 40spm is a bit longer, but you really need that rest. It does make you comfortable rating up when in pain. The Saturday evening party was great. We chatted with everybody, especially the Cernak couple, who had high hopes to win the mixed double against us, after their excellent results in New Zealand. Most of the people at the party had seen the Masters 1x race, and most frequent comments were that I was rowing technically cleaner, longer strokes, but Cernak was doing 36spm short sliding and manoeuvring his single in front of mine so I had no chance to pass. That’s nice to hear, but I would probably have done the latter as well if I were in the leading position. These small regattas are highly unregular, and everybody explores the boundary between what the referees allow and where they start issuing warnings. Another day of arriving early on the regatta venue, because Romana’s girls would have early races in the doubles. My most important race was at 13:05, the Masters Mix 2x. 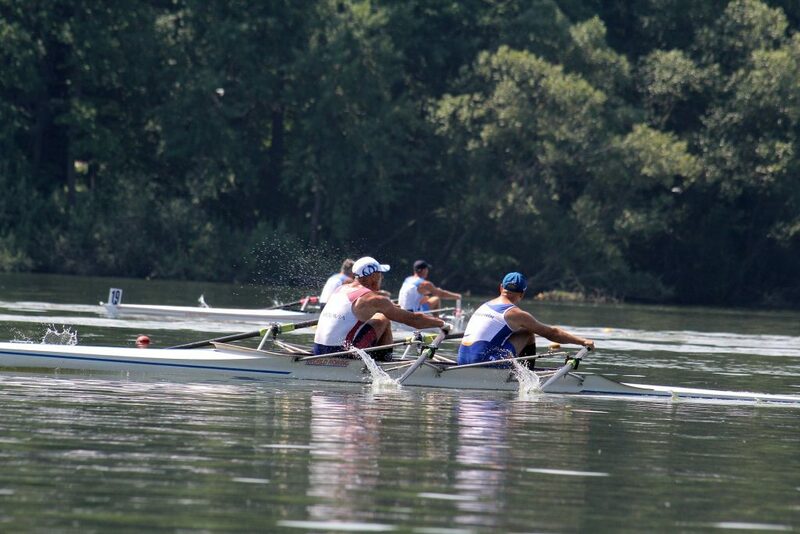 But before that, I was racing the Men’s (open) double at 11AM, together with Antonin, a Masters rower from Breclav. 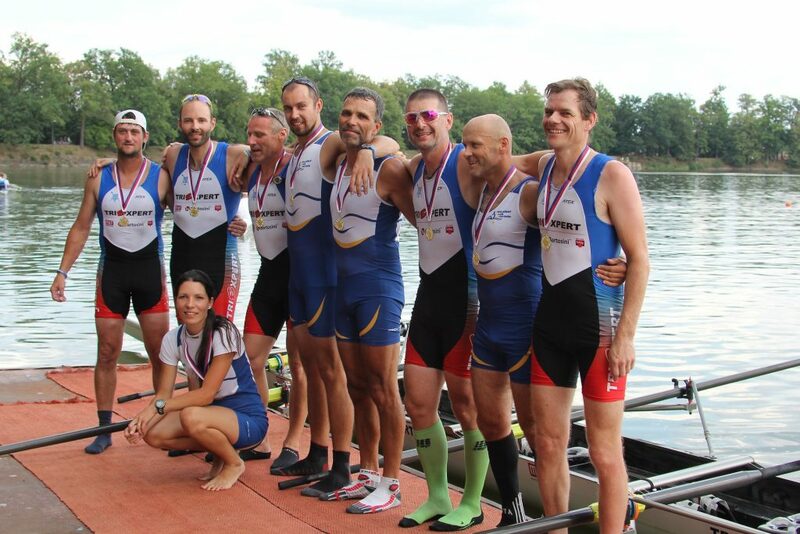 This regatta had no Masters 2x on the program, so we inserted ourselves into the open race, racing against people half our age (and half our rowing experience, of course). Around 10am, Tonda and I started our warming up. 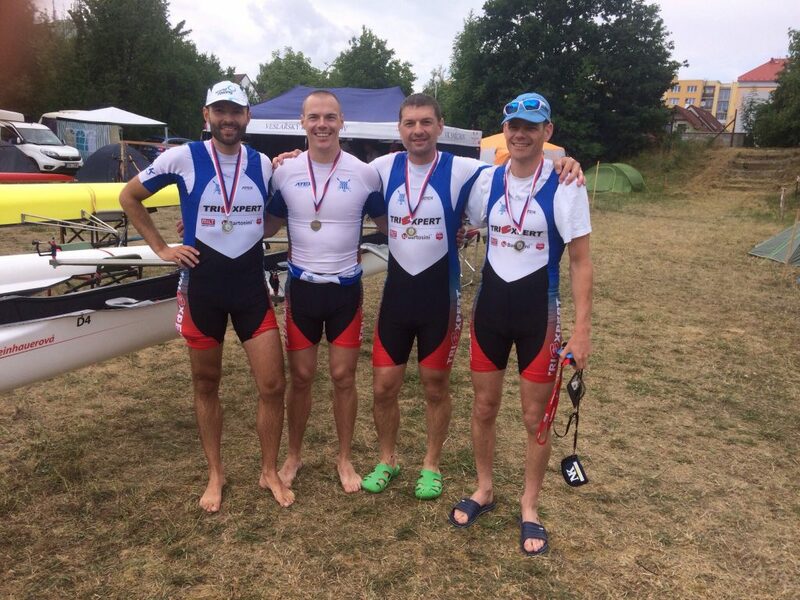 We passed the Ostrava trailer and chatted a bit with Mr Cernak and the other Masters rowers from that club. They all were going to watch our doubles race, they said. I joked that Tonda had received secret instructions to wear me out in that race, so I wouldn’t be able to peak at the mixed double. Looking at the reaction, I might have hit the mark there. I continued to joke that I was merely going to warm up the engines. On the 4 lane course, our 2x race was a three boat race. Again, we were in lane 1, with a stacked start because of the turn, so we were behind the other two boats. The referee launch arrived just before the race time, so after we started we rowed through its wake. 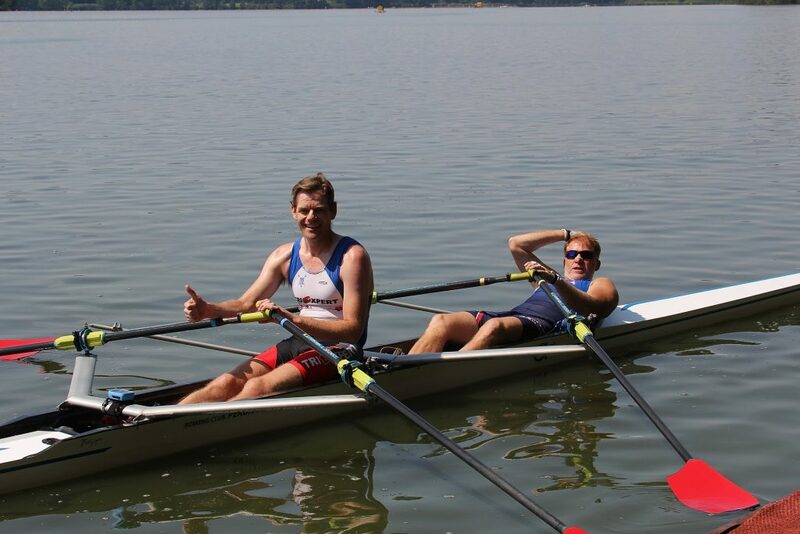 Tonda and I had agreed to row technically sound, and to my surprise that brought us in 2nd position at the 500m point. 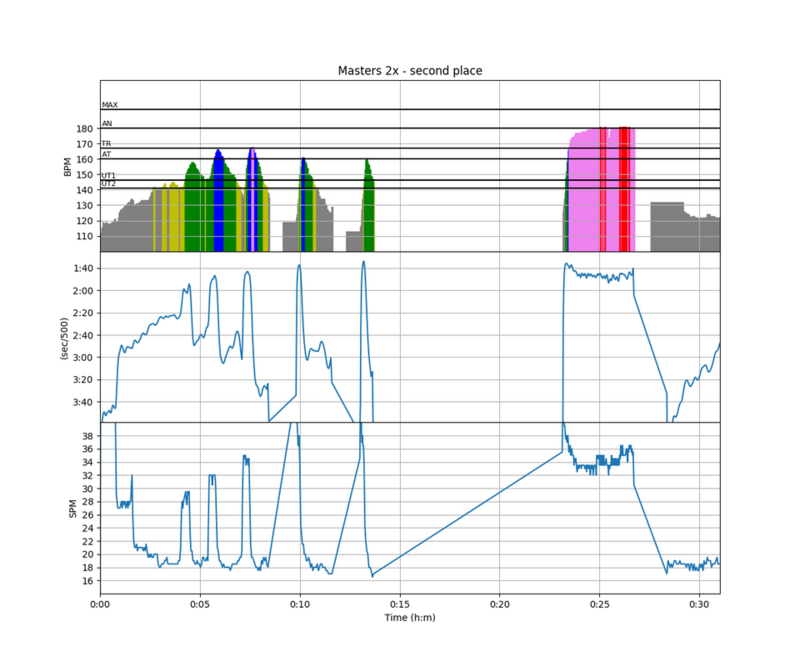 Unfortunately, the third crew managed to accelerate strongly in the final 500m, and they steamed past us in the final straight stretch, beating us by a length. In the other heat, we would have ended 3rd out of four boats. Not bad. Here’s a picture of us after the race (I am the skinny guy on the right). I used the two hours after the Men’s double to eat and drink a bit, and I did a long cooling down run. At this regatta, you have to turn the boat immediately after the finish, so there is zero cooling down, so going for a 30 minute run seemed a sensible thing to do. After that, Romana and I launched from the one and only launching dock (which effectively means there is 1 minute and 15 seconds per crew to put the boat in the water, put the sculls in the oarlocks, remove shoes, and push off) and we were on the water in time to do a few 10 stroke sequences and practice starts. Romana and I were super nervous for this race, but by the looks of it the Cernak couple was in the same state. We all arrived at the start line on time, but had to wait for the launch to arrive. When we were aligned and the starter was raising the flag (with us in lane 1, stacked behind all the other boats), Romana commented that we were in the launch wake. Indeed, only our double was bobbing around in the wake reflected of the bank. I had a split second to decide whether I would raise my hand and postpone the start or not, and I decided to take the risk and not do it. Because of that, our start was slightly worse than our practice starts (but then, those had been excellent). The rest of our race opening was executed flawlessly. 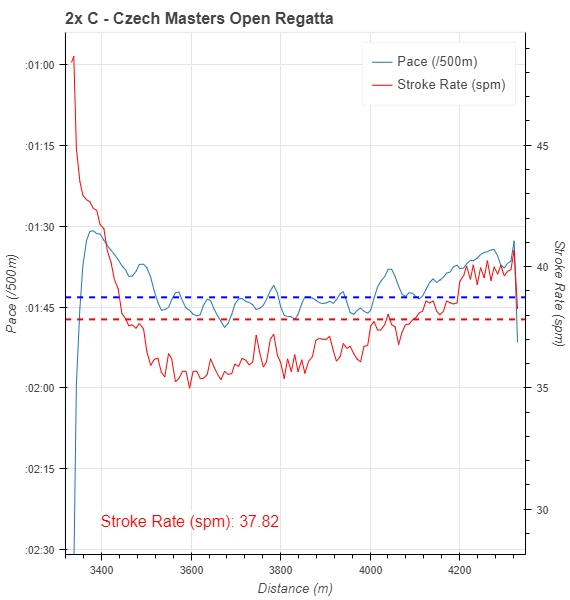 Coming out of the start at 45spm, I continued to push through the 15 hard strokes we had agreed, gradually lowering the stroke rate to 35. 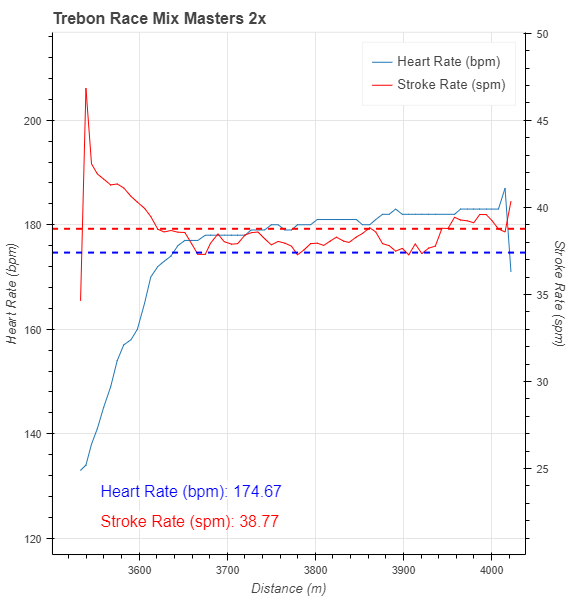 I don’t have other data than stroke rate and GPS pace, but I think the graph above tells the story of the race clear enough. 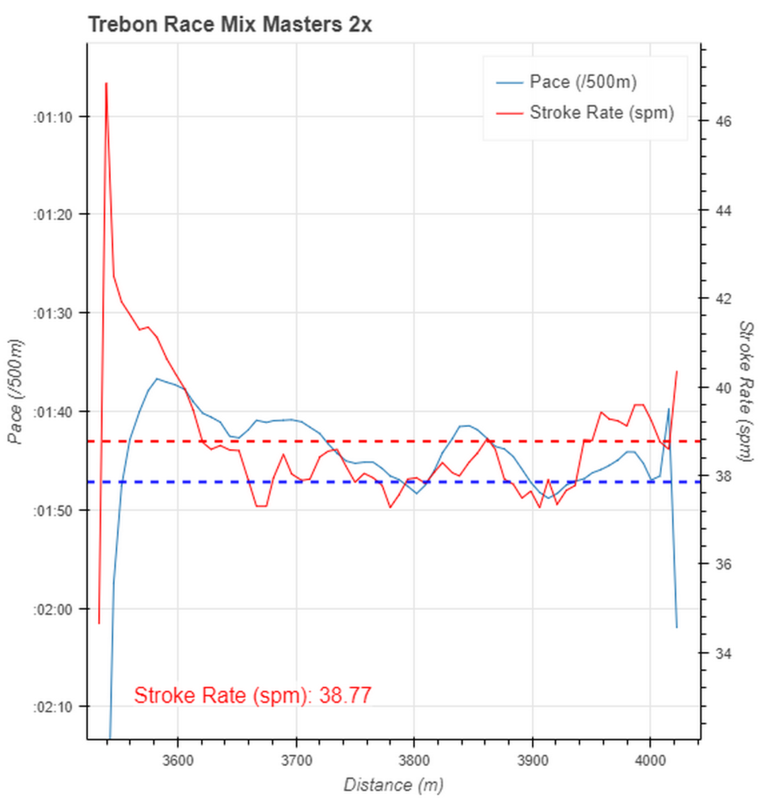 We settled for a stroke rate of 34.5 – 35 for the middle part of the race. The first 200m had brought us in front of the Cernak’s in lane 2 (who had started in front of us), and I am convinced that this “shock and awe” opening did its job perfectly. I focused on rowing a nice rhythm, and Romana on bow took care of the steering (although I did anticipate, rowing this course on memory). Romana steered a very sharp course. To our left was lane 0 with traffic coming in the opposite direction of kids’ double rowing to the start, sometimes passing each other and thus entering lane 1. Pushing steadily, we passed Burda/Masatova with 600m to go and got into the lead of the race. The referee was calling steering instructions to “Brno”, leaving it to the two Brno crews to guess which of them was the target. 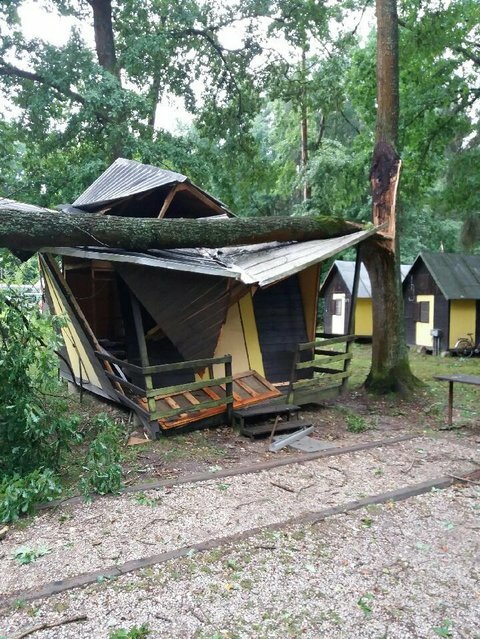 At one point it was clear though: “Brno turn – there are doubles in lane 0”. We corrected slightly and I was thinking if I wanted to win so badly that I would risk a collision. The answer was a clear no. 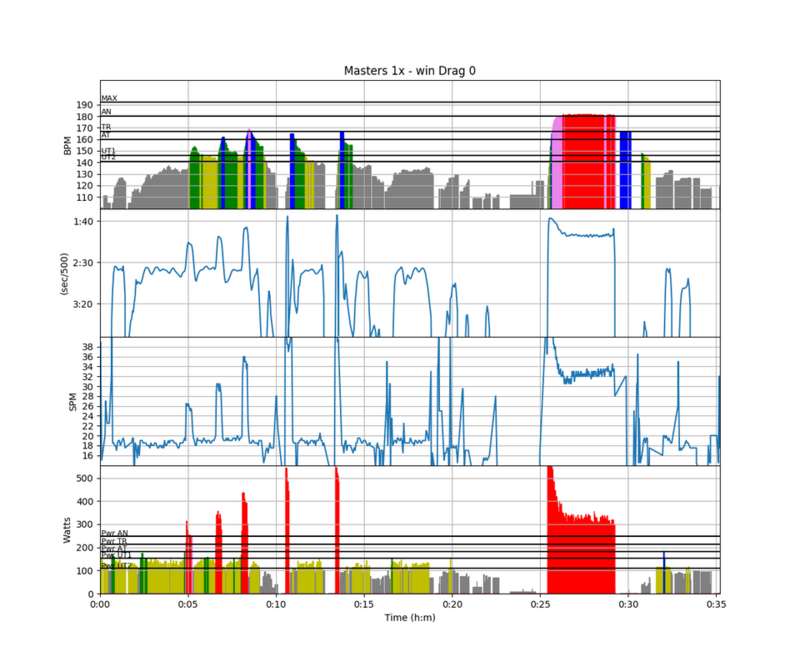 Luckily, our steering corrections helped avoid collisions. 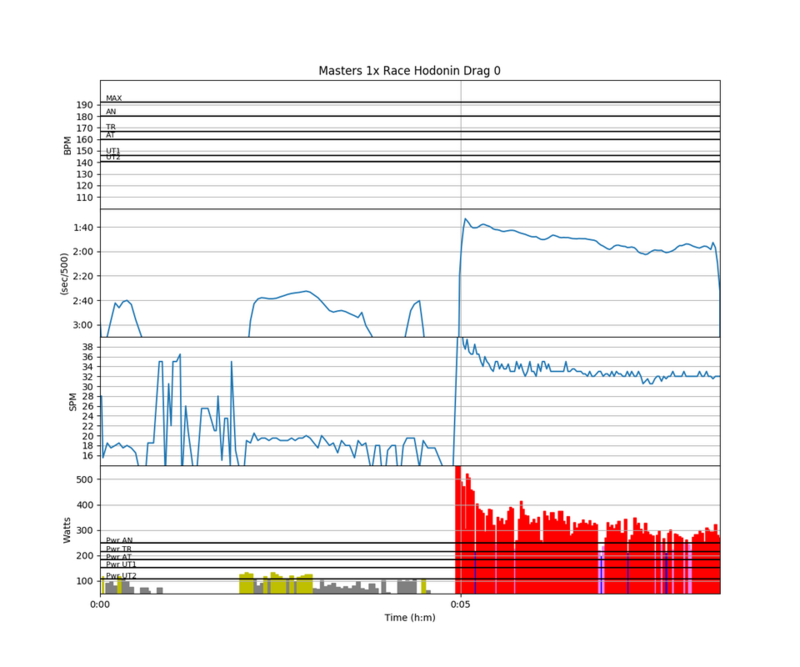 It did slow us down a bit though and Burda+Masatova were catching up again. I upped the stroke rate. At that point we were making the final turn and all the kids from CVK Brno were cheering for us. 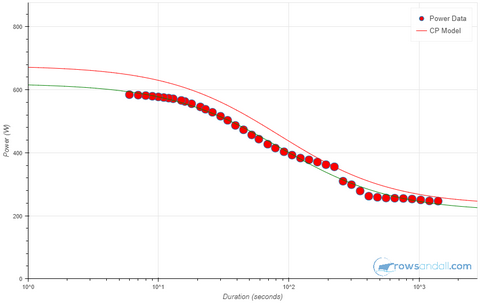 You can see how that helped from the big jump in pace between “800” and “1000” in the graph above. Still, Mr Burda and Mrs Masatova were not too far behind us, and they were still dangerous in theory. They started a final, desperate push, and I responded by a final stroke rate increase, to 36spm. The finish line and the bell. We were first. I told Romana that we had rowed an average of 35spm (the graph says 36) and she was surprised. It was true that we had found this magical rhythm which allows you to row calm and take rest on the recovery even when you’re doing 35spm. Sometimes things work out. I was definitely very exhausted after this race. 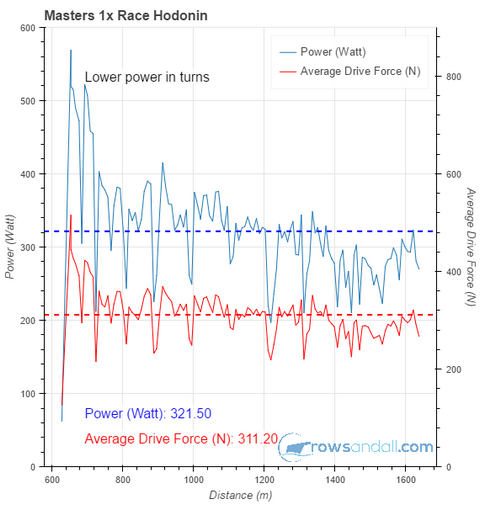 I rowed it without a power meter, but I am sure I managed more than the 321 W of Saturday. 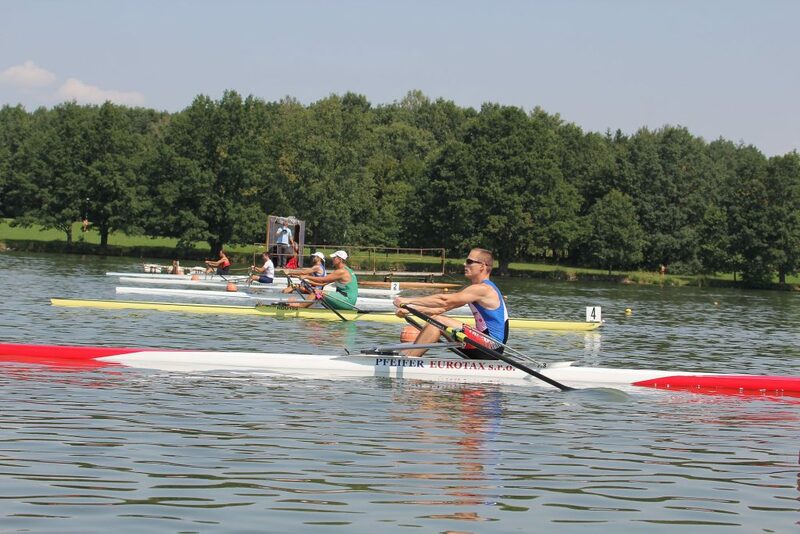 Two guys from our club raced at Junior European Championships in Krefeld, Germany. Here are pictures. Ondrej, in the single, rowed to a great 10th place, wearing our club shirt under his Czech national uni. 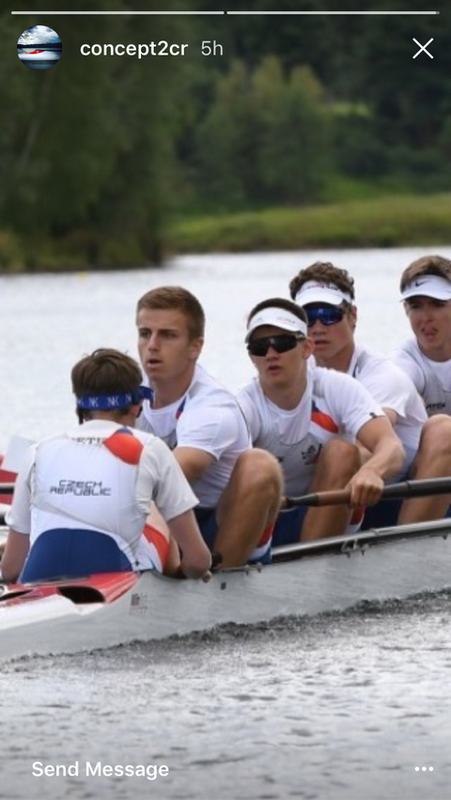 He was joined to the team as a reserve rower, so this was a great result. Vasek, in the eight, didn’t make it to the finals and they ended in 7th place. 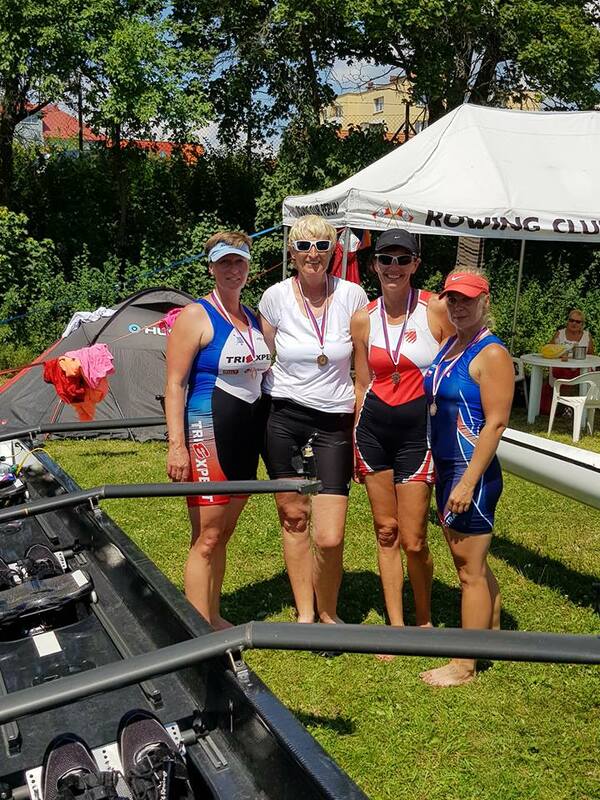 The Czech Junior girls 8+ won a Silver medal behind Romania. Congratulations! My race was scheduled for 5:30pm, but I attended the Race Meeting at 8am, hoping we would form a Masters 4-. This discipline had just one competitor, from Brandys rowing club (close to Prague), and they had asked if there could be an ad hoc opponent. I would have loved to row this race, but unfortunately, it didn’t work out this way. No problem. 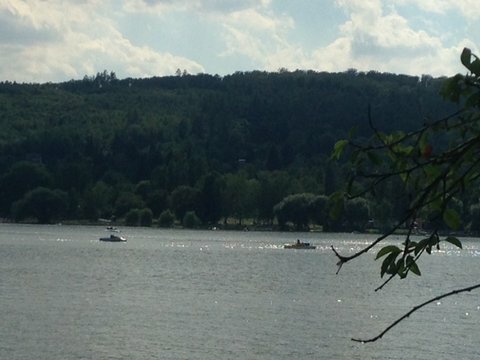 Hodonin is a fun place to sit on the river bank and watch the racing. Most of the disciplines are in the various youth age categories, and this is usually very exciting to watch. I didn’t have to wait very long to see my youngest son Robin finish his first race in the single. 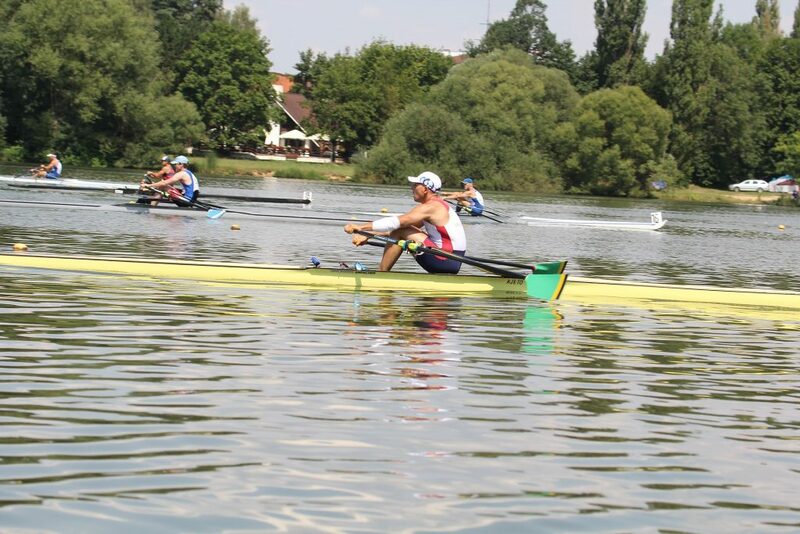 In Piestany, a few weeks ago, he flipped before the start, but this time he rowed a decent race and crossed the finish line in fourth place. 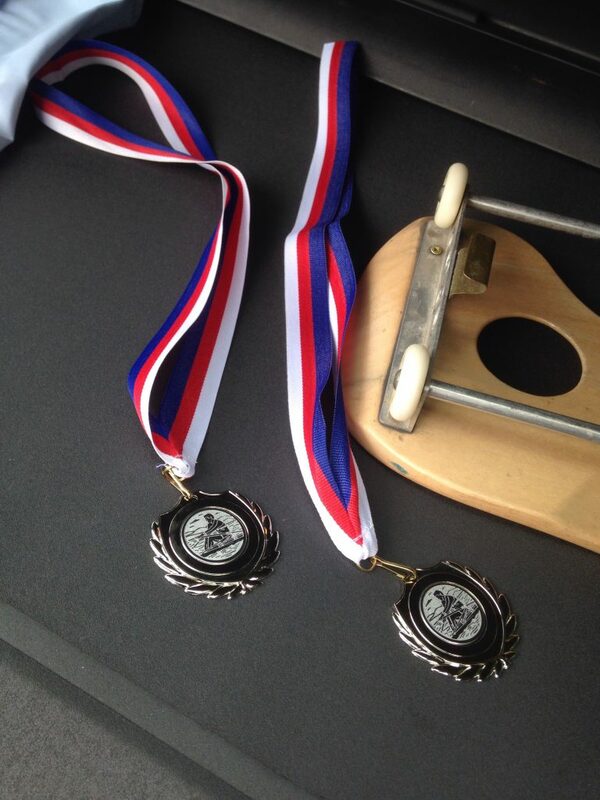 Also my daughter Lenka rowed a great race in the Juniors 2x, coming in second place. Then it was time for me to get ready for my race. 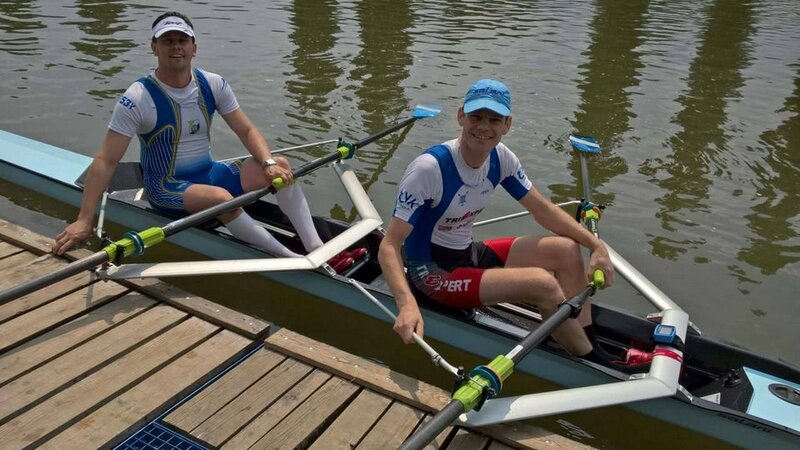 I was up against Mr Burda and my old friend Vojtech Cernak, who recently came in second place rowing at the World Masters Games in Auckland. 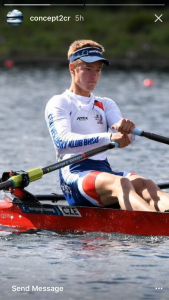 I chatted a bit with Vojtech before the race and discovered that he had spent 6 weeks in Australia and New Zealand, paying rowing coaches to work with him and training 2 or 3 times a day. 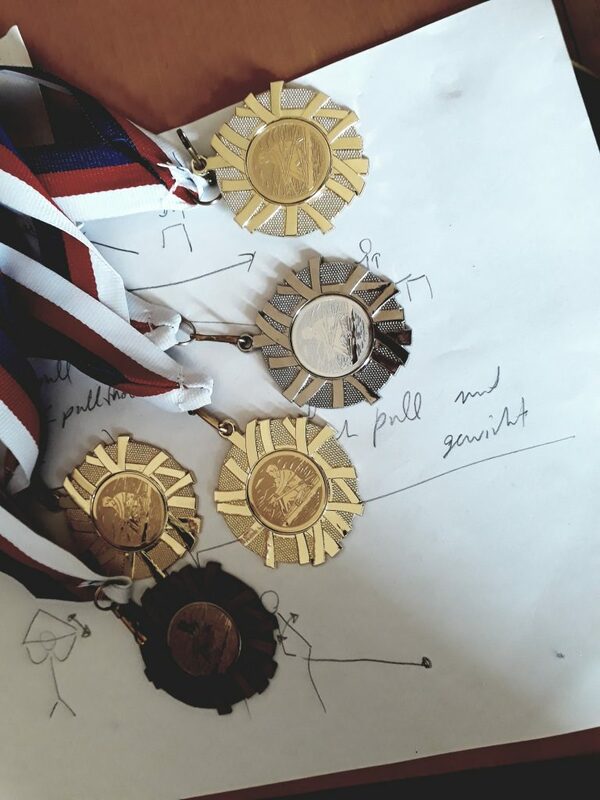 In these slightly unregular races, I was up in lane 1 on the Moravian bank, Mr Cernak in lane 2, Mr Burda in lane 3 and my friend Martin “Turkey” Krocil, from my own club, in lane for on the Slovak bank. 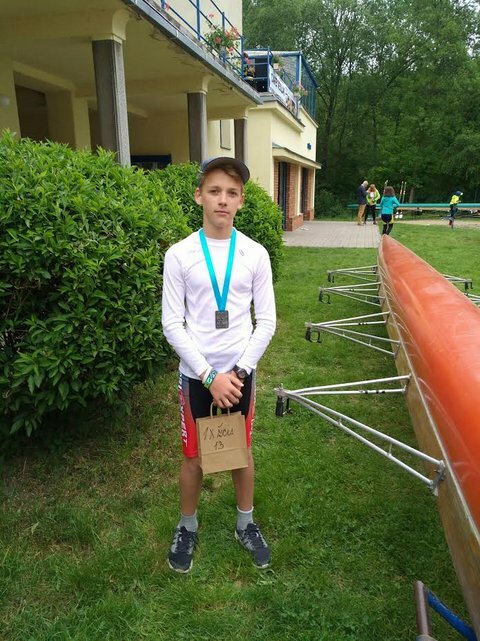 In this “international race”, that means that I would spend the race in the Czech Republic, Martin would row across the border in the Slovak republic, and Mr Cernak and Mr Burda would be crossing the border several times. 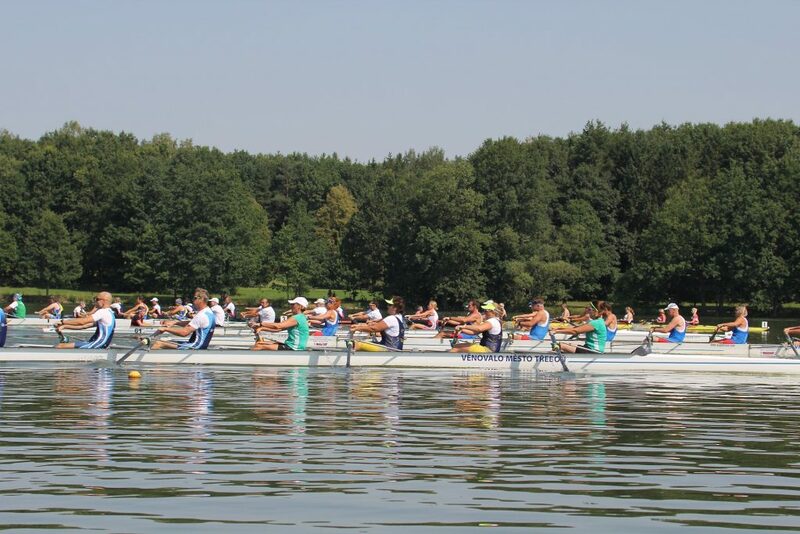 Rowing is a water sport and bodies of water are often international borders. Even after a few years of racing at this venue I find it fascinating to launch the boat next to the border sign. The advantage of lane 1 is that you row in the inner turn. 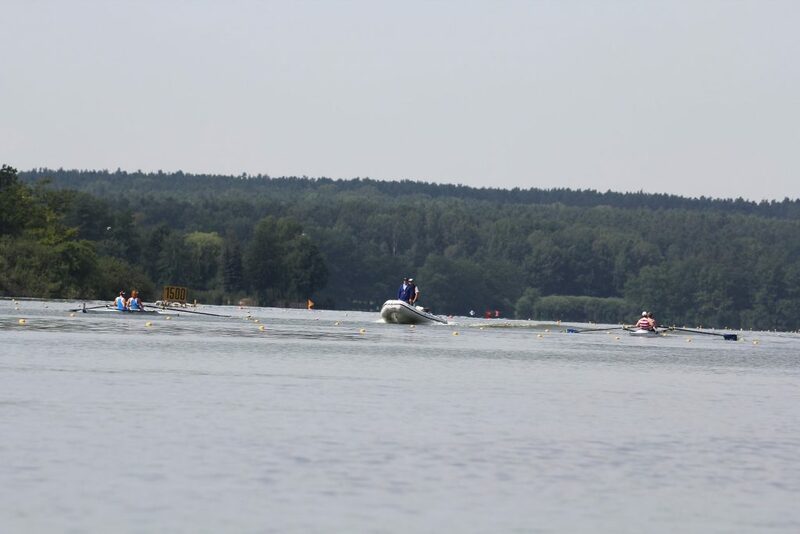 The disadvantage is that you are the last boat in a stacked start, and the disadvantage (excuse number 2) is that there is slightly weaker stream than in lanes 2 and 3. In the stacked start position, I was a length behind Mr Cernak. Immediately after the start strokes, I was still a length behind. 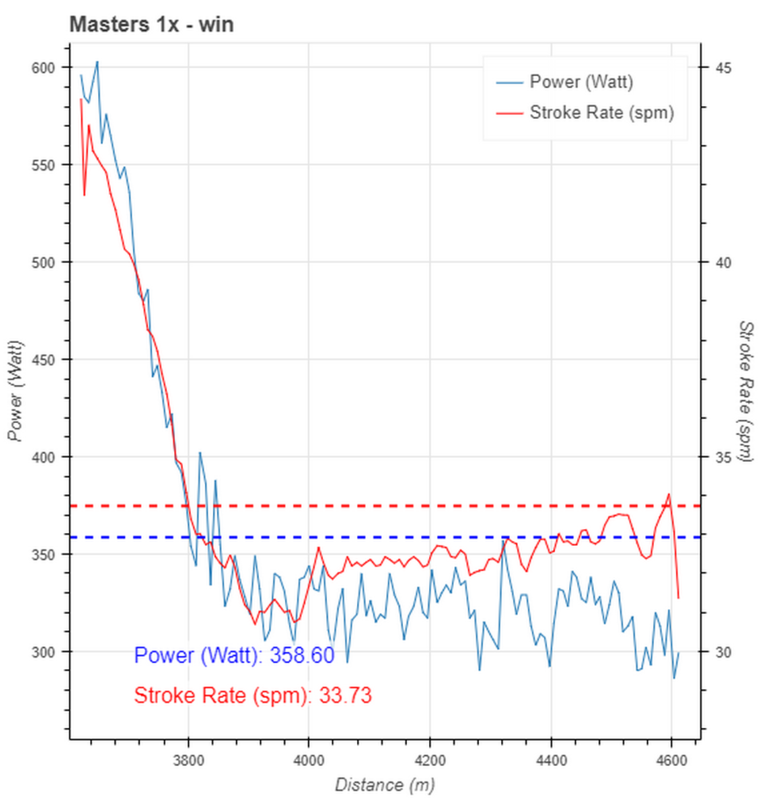 In line with my plan, I started to reduce the power to about 350W, but immediately after the first buoy (and turn) I upped the power to try and pass Mr Cernak. At this point, Mr Burda and Martin Krocil were not so relevant any more. I closed to about half a length, but I failed to push my bow ball next to his. In theory I had the advantage of the inner turn, but I didn’t really steer the ideal line. 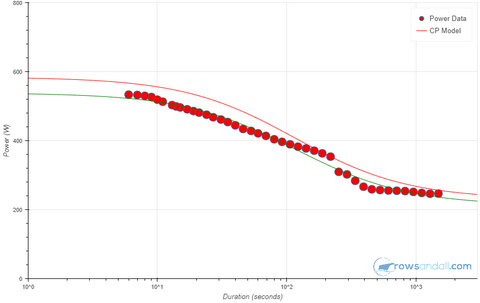 I passed the second buoy line with the buoy dividing lane 2 and 3 under my right oarlock, still a length behind. With 500m to go I was still a length behind. In the final straight part, Vojtech was smart enough to move a little closer to lane 1, effectively letting me row in his puddles and making it difficult for me to pass him. About 300m before the finish I passed through an area with lots of debris in lane 1. I actually felt a tree branch hit my fin really hard. 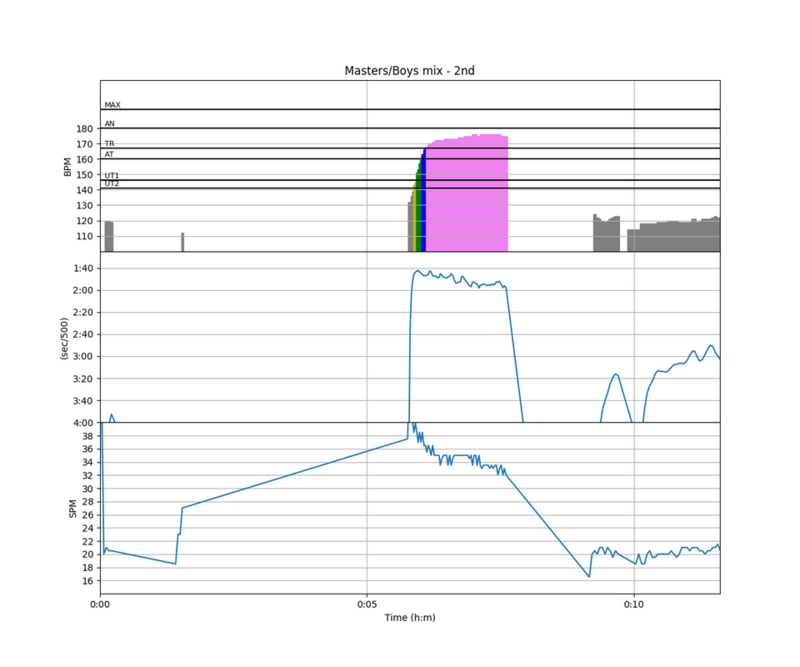 At this point I saw my power drop to below 300W, I heard the regatta speaker say something about the World Masters Games and I was unable to bring the power back up. So over 1000m I scored 320W. I need to work on increasing that number. 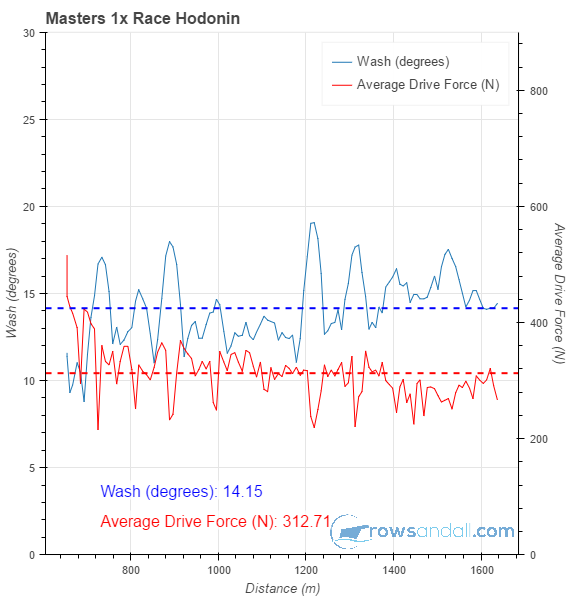 Looking at wash, the number is a bit skewed because I rowed the inner turn, so my left (Empowered) oarlock registered a few strokes where I lightened up to steer. Still, the final 400m of the race are not nice in terms of the Wash numbers, although Kleshnev’s latest newsletter suggests that my values are not bad at all. I was disappointed, mainly because I wasn’t able to surprise Mr Cernak and pass him in the first turn, then because I let technique get worse as I got tired, and finally because I didn’t even try to raise the stroke rate on the final straight stretch. I was also disappointed when I saw how deep Mr Cernak had to go. He had to lie flat in his single for a few minutes and was unable to carry his single from the dock without help. 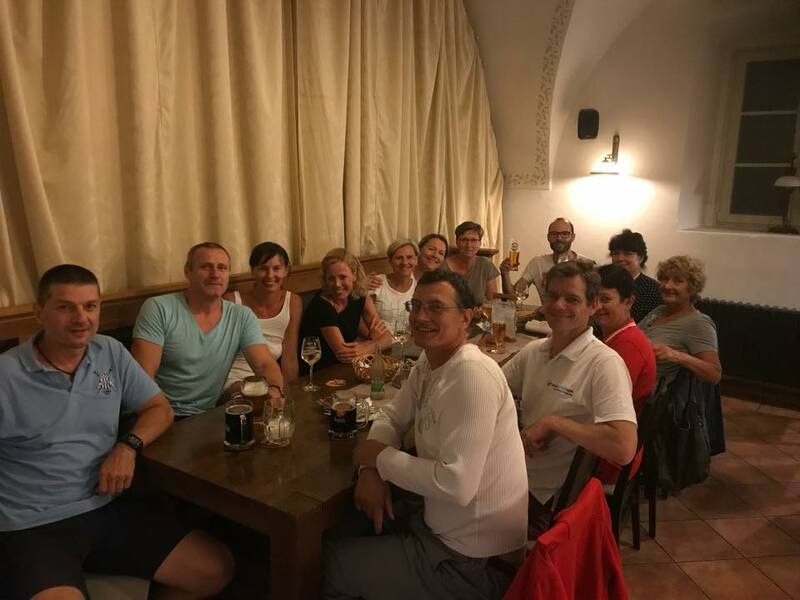 I finished the day by taking Romana out for dinner in a nice restaurant, after which we returned to the Hodonin rowing club for a party with wine tasting. 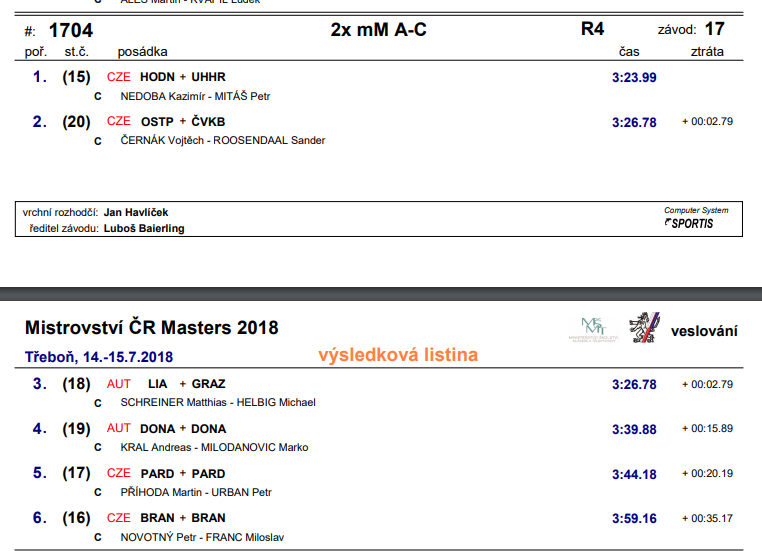 We didn’t go to bed too late, because we had important racing on Sunday, for example a mixed double row against Mr and Mrs Cernak (who managed a second place in this discipline in the Auckland World Masters Games).